Today has been fantastic! Before going to bed last night I left my Garmin and Heart Rate Monitor right next to my bed, ready to put on as soon as I woke up – I wanted to measure my resting heart rate after a decent sleep…I’m not so sure I got a decent amount of sleep but it was decent enough with no disturbances. For some reason I woke up just before 0730hrs, slipped on the monitor and pressed go – I almost feel asleep but managed to catch the timer at 1:30. So, my resting heart rate is 47 beats per minute – I’m pretty pleased with that and I know it’ll only get better the more I train! Onward then, to training! Or not. I tried to go back to sleep after I’d taken the heart rate monitor off but my body was having none of it. Fifteen minutes later and I’m in the kitchen making a cup of coffee and a bowl of muesli, I figured I’d head straight out on the bike but my dog gave me some puppy eyes and so it was that I took him out for an hour and fifteen minutes first. On returning from walking Loki (my dog), I brewed up another cup of coffee and munched an apple whilst doing some stretching. 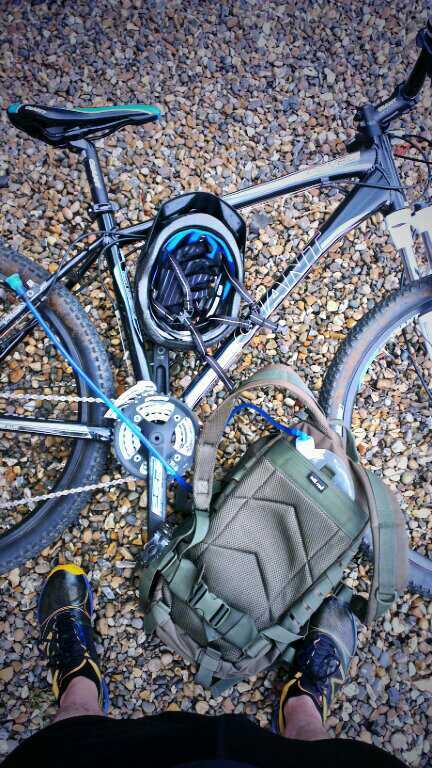 I packed up my riding pack with some water, spare inner tube and a multi-tool or two. I had a bit of an “Um” and an “Ah” about footwear choices though. I’ve been wearing some pretty flimsy but lightweight canvas type shoes on my rides since I got the bike but I also like to wear these when the weather is hot. They take a pretty decent battering on every ride so I thought I’d retire them as of this morning! There I am, in my hallway looking at my running shoes and thinking ‘Which pair of you guys is not really fit for running anymore?’. This is when my eyes began to linger on my favourite, yet least used of late, pair of running shoes. Favourite because they’re so versatile, least used as I’ve worn them down a little too much. So, on went the New Balance MT110s – built for ultra-trail running and fast mountain runs so I had no doubt they would be perfect for thrashing about on the trail and a little ‘off-piste’ riding. Shoes selected, I grabbed my lid, donned my gloves and headed on out the door to be greeted with a beautiful morning! Sunshine, warmth and a light breeze – perfect for a good ride. I won’t go into too much detail about the ride but I will say that I found myself riding ‘off-piste’ a couple of times as trails either petered out or were non-existent! There were a few hairy moments where I thought I was heading towards Stackville but I just about managed to wrestle control back and avert what felt like the inevitable high speed crash! I did hit a couple of road sections – one on the way to my trail start point, one as I transitioned between one set of woods to another and then the longest section to finish the ride. It was during the final trail ascent of my ride that I began to consider turning today into a brick session. I did mention on the blog yesterday that I had this planned but felt in no shape to do it so I thought, as I was feeling so great today – ‘Why not?!’. It was at this point my shoe selection began to make absolute perfect sense to me – I couldn’t wait to get on the trail to test out my post-riding legs as I’ve never done a brick session before. It took 3:17 to dump the bike, take off my pack, lid and gloves and then take on a decent amount of water before setting off on the run. I will most certainly be working on reducing this time! Anyway, on to the run – JELLY LEGS. For the first 800m or so my legs felt sluggish and not too great at all and I was already regretting the decision to run. I figured that I’d do 1.5km (which would be the loop distance back to the bike) and then call it a day. However, as I passed the first kilometre I was surprised to see the Garmin telling me I’d gone through in 4:36 – which is 21 seconds faster than my usual ‘easy’ paced runs! With this in mind I carried on running and began to feel great. It was a wonderful run, for some reason it didn’t feel too laboured at all! Kilometres 2, 3 and 4 were also run between 2 and 9 seconds faster than ‘easy’ pace. The final kilometre, without even thinking about it, was completed in 4:30 – faster than the first and much easier as my legs had found their rhythm and shaken off the bike ride! Woo! Love my bike, love my shoes and here they both are after my brick session this morning. After my warm down I fixed up some lunch and sat back to watch the latest episode of ‘Breaking Bad’ (Oh.My.God – what a show!). Once that was done I fought off the temptation to have a nap and instead took a soak in the bath for about an hour and fifteen minutes with George R.R. Martin’s ‘A Dance with Dragons’ – blissful. I don’t remember the last time I had such an enjoyable and fulfilling day off work! For some reason I began to crave a Mars bar while I was in the bath, so I took a nice slow stroll and bought one (great decision, very happy) – and here I sit; munching a Mars bar, listening to some classical music and getting ready to have that nap that I put off earlier! This entry was posted in Post on Aug 19, 2013 by Al Flowers.